This week I'm featuring the first novella in The Backcountry Brides Collection, titled Shenandoah Hearts, by the woman who started it all! 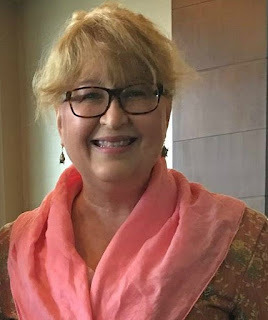 Carrie Fancett Pagels founded the team blog Colonial Quills 7 years ago this month (we celebrate TOMORROW with another tea party), and an all-colonial novella collection has been her dream for quite a while now. 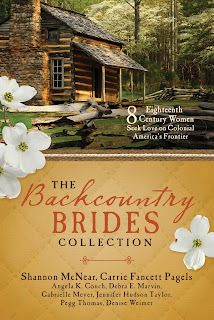 Shenandoah Hearts is set in 1754 on the Great Wagon Road from Philadelphia down into the Shenandoah Valley of Virginia. 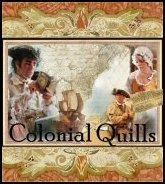 As the French-Indian War commences, Magda Sehler wonders if Jacob Owens lost his mind to have abandoned his Philadelphia business and moved to the Shenandoah Valley. Or has he lost his heart? Jacob Owens is a prosperous merchant, owning and running a Philadelphia shop. He’s had the wonderful ladysmith, Madga Sehler, working with his family for years. But the Sehler family is relocating to the Shenandoah region of what is today Virginia. This backcountry area was dangerous. Beautiful but dangerous. Far from Jacob’s home. And did I mention dangerous? In romance we always have the “why?” and the “why not?” I’m a big proponent of understanding the characters’ backstories. So what do we have in Jacob’s present day and in his backstory that would lead him to abandon his livelihood in Philadelphia? Jacob’s parents lived in Philadelphia and brought him up there. But wait – his grandparents had lived in the backcountry. And every visit to Philly brought tales of the glorious beauty of the Blue Ridge mountains. So his grandparents had lived there in the early 1700's, my oh my – and what adventurers they had to have been. Jacob’s eldest brother is, in fact (and fiction! ), living in western Virginia, developing a forge and iron working business in which Jacob will share partnership. But…Jacob’s next eldest brother is in the military. He has been sent to the western area of Virginia in the Shenandoah Valley, to guard against encroaching French interests. And he tells Jacob this is an area brewing with trouble. These two brothers are particularly close. And Jacob’s brother has planted the notion that if ever Jacob should wish to journey to their grandparents’ former “backyards” that he’d be welcome in the milita. Or as a supplier to the forts, which was badly needed. What’s a man to do? When Magda leaves with her family, apparently accepting an offer of marriage from the older wagonmaster, many a man might decide – she’s made up her mind. But a wise customer shares her advice. And Jacob seeks God’s direction in his life. Want to know what happens? Leave a comment for a chance to win a copy of the collection! Also, don’t forget to enter our Rafflecopter giveaway, which runs through May! 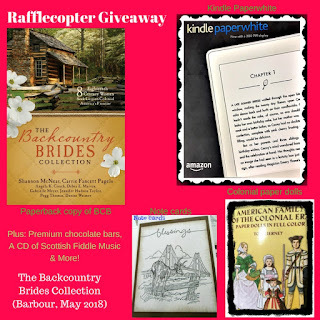 LAST TWO DAYS FOR THE RAFFLECOPTER GIVEAWAY!! Thanks for hosting me, Shannon! Thank YOU, Carrie, for everything you do!! You ladies have done a splendid job. Loved this collection! Blessings for future success!